We have a dishwashing rule at home and when we’re camping — whoever cooks the meal gets to relax while the rest of the crew takes care of clean-up. This rule has been in place since our kids needed a step stool to reach the sink, and it helps so much to have the whole family pitching in when we’re camping. By far, the most inquiries we get here at Back Road Ramblers are about what to cook when camping. After that, families want to know about how to wash dishes while camping. Have you heard of Leave No Trace? We try and follow these principles whenever we’re camping, whether we’re living it up in a rustic cabin, staying in a frontcountry campground, or roughing it in the backcountry. You can read more about Leave No Trace principles in the link above, but I’ll summarize the bit that applies to washing dishes. Cook only the food you will realistically eat – Unless you have a way to keep food reliably cold, leftovers are a pain. It will definitely take some experimentation, but try and only cook enough food to feed your family without any left over. If you do end up with leftovers, scrape your pots and pans into your campground dumpster. If you’re in the backcountry, you’ll have to double bag it and pack it out. 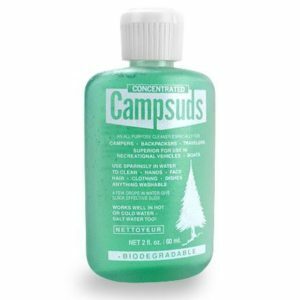 Wash camping dishes at least 200 feet away from streams, lakes, or other water sources – Dirty dishwater can quickly pollute streams and lakes, even if you use biodegradable camp soap. Many campgrounds will require you to wash your dishes at your camp, not in common areas, and to do that you’ll need a camping wash station (we’ll talk about that more below). 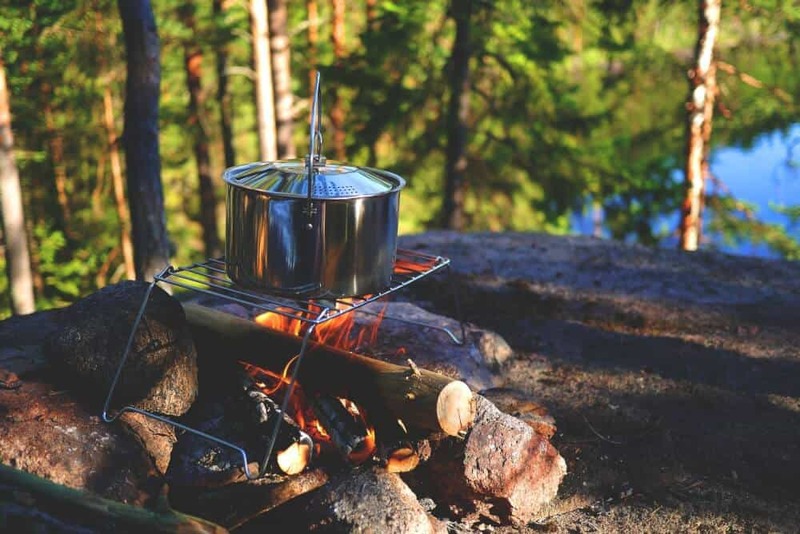 Dispose of dishwater properly – Campgrounds will often have a sink or grey water disposal area to dump your dish water, but if not, strain your dirty dishwater and disperse it at least 200 feet away from your camp, trails, roads, and water sources. soap for our dishes, and we also use it to wash clothes and dirty hands. I usually buy a 16 oz. bottle at the beginning of each season, then I pour it off into a smaller container for each camping trip. Also, the bottles are 100% leak proof and reusable. Our camp dishwashing station comes with us on all of our car camping adventures and canoe trips, plus many short multi-day hikes. When we’re backpacking, we often wash our dishes with just one small bucket, and sometimes we wash our dishes with leaves and dirt (for real), and just use our collapsible dishwashing bucket to rinse the dishes. This is a good overview of how to wash your dishes with dirt, although I wouldn’t rinse my dishes with bottled water as the video suggests. Two collapsible buckets or plastic tubs – You’ll need a bucket for washing and one for rinsing. 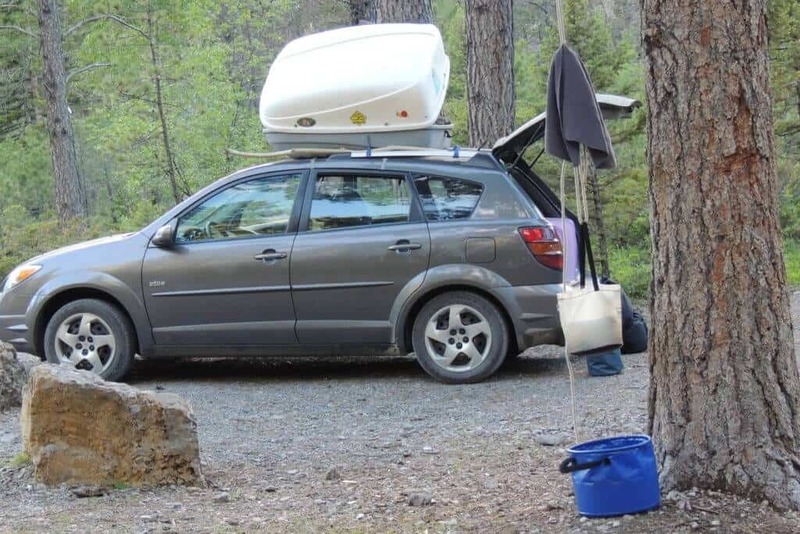 If you do mostly car camping, you can get away with any plastic tubs that will nest together and hold water. If you think you’ll need something more portable for hiking and backpacking, opt for lightweight, collapsible buckets that will fit handily in your backpack. These Sea to Summit Ultra-Sil Kitchen Sinks are just 1.7 oz. each and come with a small stuff sack. We use one of these for washing dishes, and then we hang the rinse water from a tree in another Sea to Summit bucket. We like to have the rinse water set up all the time so we can use it as needed, and if we left it on the ground, the dog would knock it over. A washcloth and towel – We really like using quick-dry microfiber cloths for both washing and drying. We wash our camp dishes, hang up the towels, and they’re dry by morning. Unfortunately, we tend to lose them, and sometimes, we just bring sponges and dish towels from home, especially if we’re car camping. A strainer – A small strainer is awesome for capturing food from your dish water before you toss it into the woods. It’s important to do this because if you’ve got food in your dish water, it will certainly attract animals. A terrible photo of our camp dishwashing station. 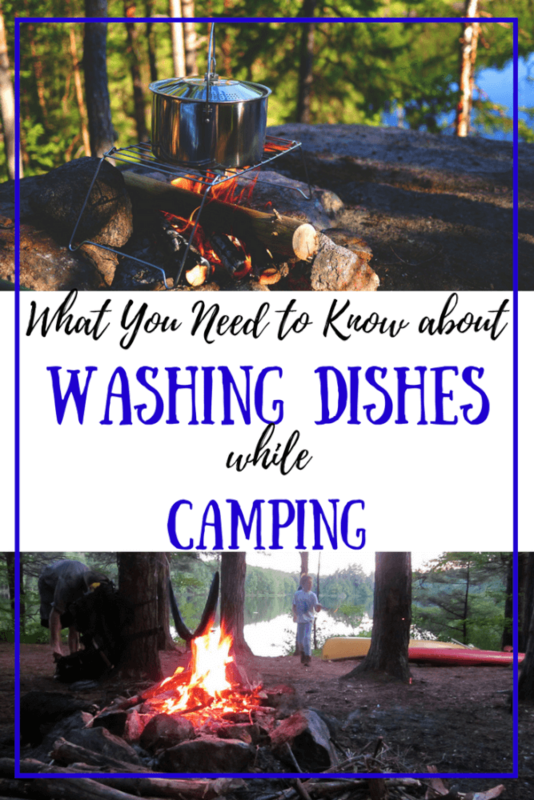 Perhaps the actual dishwashing is self explanatory, but I’m going to tell you exactly how we wash our dishes while camping at frontcountry campgrounds. Prepare your amazing camp meal. After you plate up the goods, fill your cook pot with water and let it sit over your campfire. This will make your dishwashing water tolerably warm. It will also keep the food from sticking. If you used your frying pan, add a bit of water to that as well and let it sit. Enjoy your awesome camp food. This is obviously the easy part. Fill up one bucket with cold rinse water. If you are anything like my husband, you will have done this upon arriving to camp. Add a capful of soap to your second bucket and fill it halfway with cold water. Add the hot water from your cook pot. 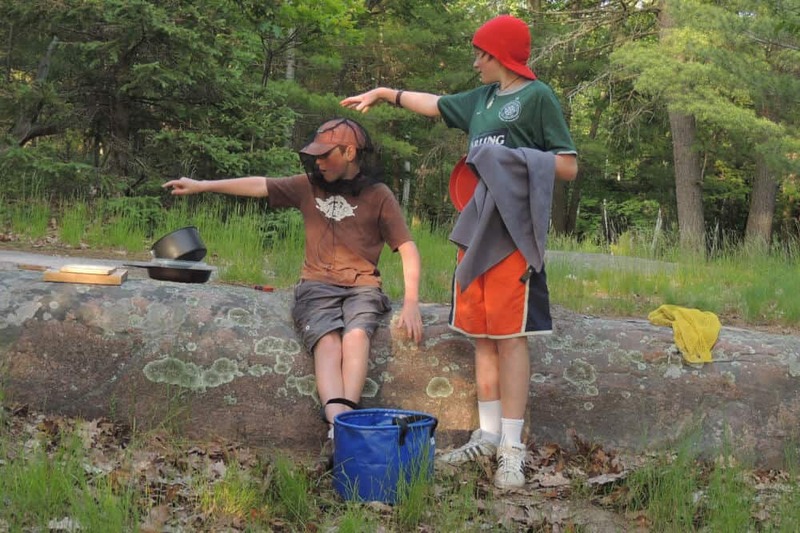 Convince your kids to wash the camping dishes. Add the silverware to the soapy water to soak. Now immerse each dirty dish one at a time, starting with the cleanest dishes and moving on to the cook pots and dishes with stuck-on food. After washing, dip your dish in the clean rinse water. Hand it to the designated dryer, or if you are flying solo, stack the clean dishes on a rock, stump etc., where they’ll stay clean. Dry the dishes with your microfiber towel and put them away until the next meal. Disperse your bucket of rinse water 200 feet from your campsite. Spread the water far and wide to minimize impact. Ignore this step if your campground has a designated disposal area for dishwater. Now strain your soapy water into your empty bucket and disperse the dish water in the same way. Throw away your food waste or pack it out. Go vegetarian – We find that cooking meat just makes a mess and attracts animals. A greasy pan quickly mucks up the dish water, and then the pancakes end up tasting like burgers. Maybe you like that. I don’t. We almost always cook vegetarian while camping. For meat, we bring jerky, pepperoni, and tuna fish, which is usually eaten straight out of the pouch. Use bread to clean your dishes before washing them – Isn’t this the best use of bread anyway? You can sop up all the delicious sauce, soup, or flavoring to make washing easier. Don’t burn your camp food – You know what they say about an ounce of prevention… When you’re cooking your camp food, don’t take your eyes of the pot. Add more water than you think you need and stir frequently. A burned pot is the worst when camping. Please don’t use disposable tableware – Believe me, I know it’s tempting, but as outdoor lovers, you owe it to our one and only earth to tread lightly and reduce your impact. Don’t let the thought of washing dishes while camping keep you from enjoying the outdoors. Once you have a system in place, you won’t think twice about it. If you enjoyed this post, I’d be so grateful if you’d share it on Pinterest. How do you wash dishes when camping? Our readers would love to read about your dishwashing system in the comments below. Mess bags. Everything for one person in one bag that they are responsible for. Hang your mess bags from a line to dry, use that same line to dry wet clothes. Wiping your dishes before washing is a biggie. If you don’t have a strainer, use a bandana. We’ve done a lot of camping as a family in a camper and in a tent, and a lot of camping in tents as Girl Scouts. We don’t use individual mess bags, but it’s a great idea, especially for large families. This topic may just be those articles that must gain more attention! Lmao, I couldn’t stress this important factor especially when it comes to camping. Not to mention, glamping (glamorous camping) – same outdoor activity that has that extra umphhh! Thank you for sharing this. Thank you for sharing this article. I remember when I was young my mother always let us do the dishes even at camping as I get older, I understand her. lol! Anyways, we do the same thing whoever cooks gets to rest and those who don’t, needs to do the dishes. Thank you for letting others teach the right way not to leave traces. Amazing, keep it up! I’m seriously always so inspired by your posts about camping. Cooking food you’ll eat is so huge! I have been camping before where my friends cook dinner and there’s enough for an entire fleet! I’ve never heard of the biodegradable soap! So cool! I usually just wing it with water and a really good scrub. I’ll have to check that out. Thank you so much, Paige! That means a lot. The Camp Suds are fabulous! We even used it as a shampoo one weekend when we forgot ours. Worked like a charm. The one who cooks does not wash dishes, this rule applies at my house as well. And my mom insists on filling all the vessels with water so that they clean up easily. Washing the vessels with dirt in an incredible way to stop land and water pollution. I loved all the tip and I will bookmark this and use this when I go camping! I’m so glad we instilled this rule when our kids were young, Sandy. They never complain (any more), and I get to relax ’round the campfire. I’m not really a camper so the points you brought up are things that would’ve never been on my radar. I had no idea that there was a 200 feet rule to washing near bodies of water and even with biodegradable soap! I’m not sure even if my friends who camp actually bring all those materials but I’m actually going to send this to everyone to make their lives easier! Awesome post! Thanks so much for sharing, Izzy. With so many people enjoying camping, it’s really important that we work to keep our campsites clean so that we can keep enjoying them. This post came at the right time as I am thinking of camping for my very FIRST time here soon. I always wondered about how to get the dishes clean and if one would use the water around streams (as I have heard others do so). Now I realize that makes no sense. Wow, what a practical and useful post. I’m with you that the people who dont cook should clean and close up, whether at camp or at home! I’ll also make sure to use your guidance when I do go camping. These are some really good practical tips to not only do the dishes whilst camping but to do them in an environmentally responsible way. Thanks for sharing and I’ll be sure to keep these in mind next time I go camping. Juliana – we head to the local eateries too if we can. They’re hard to resist, especially when you’re hiking all day and sleeping in a tent. Sometimes it’s nice not to have to drive, though. I had no idea there was protocol for washing dishes while camping. To be honest, I don’t think I would even think to bring dishes if I were camping, but I know absolutely nothing about camping. All good information to take in if I find myself camping. Hahhaha, I totally agree that the ones who don’t cook are the ones to wash the dishes 🙂 I haven’t gone camping in a while, but such a great tip to fill the pots with water after cooking so that they will be easier to clean later.